In order for magic to happen, Big Data firms need to adopt a different mindset and step into the shoes of the organizations they sell to. They need to not only be able to provide or collect the data, they need to make it relevant to potential enterprise clients and explain why it all matters. They need to help retailers and banks, for example, understand how bits and bytes can make them more responsive to customers or help them adapt to market conditions in real time. This necessary shift – from being able to develop technology to being able to convince corporations of its value – is essential and especially difficult for entrepreneurs who may have been trained as engineers. The technology is critical, but it must translate into complete solutions to gain adoption. ...Social networks tend to skew toward an upscale, younger demographic, and they skirt lower-class neighborhoods like tourists in Las Vegas who never leave the Strip. Put another way, the elderly women in Philadelphia who doesn’t have a photo ID also probably doesn’t tweet much or contribute to the 15 terabytes of new information on Facebook every day. In fact, technology can be a two-edged sword. Remember the 1948 election, when the polls predicted a Dewey landslide over Truman? That election marked the first time pollsters relied on telephone surveys, giving them access to more voters—big data back then. It turned out that a lot of Truman supporters didn’t have phones. A parallel exists today: a growing number of U.S. households rely on cell phones instead of landlines, and pollsters don’t have access to most cell phone numbers. Despite the drawbacks, it's certainly going to provide a really interesting perspective on at least how a subset of the US electorate thinks and feels about the election. Ending August with a final look back at the week in data news. by Hint.FM—a collaboration between Fernanda Viégas and Martin Wattenberg—visualizes wind flows across the continental US. It's been around for a while, but it's a particularly interesting way to view Hurricane Isaac's strength and location. 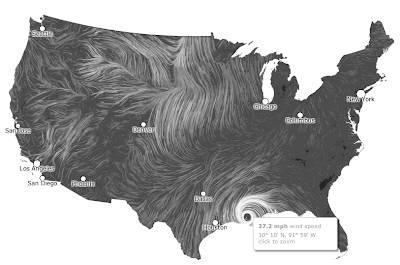 Wind map by Hint.FM—a collaboration between Fernanda Viégas and Martin Wattenberg—visualizes wind flows across the continental US. It's been around for a while, but it's a particularly interesting way to view Hurricane Isaac's strength and location. , which includes partnership centers at the University of Texas Austin, the University of California Santa Cruz, and Los Alamos National Laboratory. How is data important to policymaking in education? Education data is hugely misunderstood and misapplied. The use of data in education needs to come into parity with how big data is understood and used in other fields. This can be done through a better understanding of two policy frameworks which are currently not joined. The first is a human capital framework, or a macro-education frame. The United States has to compete globally, but education is delivered and guided locally. This is a significant disadvantage given that most countries have a single education system where policy, funding, and performance are managed centrally. The second framework is an public investment framework, or a micro-education frame. Education averages at least 25% of every state budget and a similar percentage comes from municipal budgets. Since more than half of the states in the US and many localities have reduced their annual expenditures, and cost-paring continues while pension payouts rise, we are cutting instruction at a time when we should be investing in it to create more jobs and new industries. The impact is acute in low-performing urban and rural schools. What are the big gaps in the data or research related to education? Data in education, like every other sector, is extremely important. However, educational data usage is constrained in ways that would seem odd and inefficient to the consumer, IT, financial, pharmaceutical, or security sectors. Large-scale data collection, as mandated by the Federal No Child Left Behind law, requires states to report on annual yearly progress (AYP) of students in order to receive Federal funds. While the merits of annual "summative" testing are often debated, what is not often discussed is the fact that this data primarily travels in a single direction—away from the student. While data gets fed back to the school districts, it does not come back in time or in a form useful for addressing individual learning needs of students. Unlike consumer data and other use-data, in the case of education, the end user is not in the data loop. Daily and weekly "formative" tests are given frequently without any standard reporting nor correlations to the annual "summative" test. So, from a data-driven policymaking perspective, there are many disconnects. What's the long-term vision for National Laboratory for Education Transformation? NLET is organized to bring the best minds, methods and organizations—from outside education—to address the problems mentioned in the two earlier questions. We believe that the actual stakeholders in commerce, industry, and security need to be part of the community that reconstructs education for the challenges of this century—the same way the leading industrialists helped organize education in the early 1900s. Our vision for NLET is four-fold, but starts with data: constructing actionable data ecosystems that can be understood and utilized by policymakers, educators, parents and students. NLET is intent on creating a dynamic map that displays macro-education data and related data in a visualized system. Like Google Earth, a user can zero down to the micro-education data for a local school or district. We need to have a highly interactive data landscape system to better understand education across all the localities. Data properly conceived and used in the macro framework could help guide states to create competitive human capital, while the same data could help states in the micro framework better spend and deploy funds locally. Gordon Freedman is president of the National Laboratory for Education Transformation, which includes partnership centers at the University of Texas Austin, the University of California Santa Cruz, and Los Alamos National Laboratory. (UC Berkeley), Mike Flowers (City of New York), and Jake Porway (DataKind). Video below! We'd love your comments and feedback on the conversation! We want to make discussion around data-driven innovation as engaging as possible. So we decided to try using Google+ Hangouts on Air, which allows you to broadcast and record a Google+ Hangout, to bring together people working with and around data to discuss issues relating to the future of data-driven innovation. Our first hangout was held today, featuring Marti Hearst (UC Berkeley), Mike Flowers (City of New York), and Jake Porway (DataKind). Video below! NEO CANDO, a publicly accessible database, provides one-stop-shopping for anyone looking to research property information in their neighborhood. The site allows users to go beyond researching individual properties and look at snapshots of neighborhoods—including which properties are at risk of foreclosure and which have been condemned. The site also contains social, economic and census data. The site is a resource for public officials, academics, and residents alike to understand trends in local communities. According to a recent Pricewaterhouse Coopers survey, about 33 percent of U.S. consumers use social media websites like Facebook and Twitter to obtain health information and track/share symptoms. Seventy-two percent of respondents said they would use social media sites for scheduling physician appointments, and 42 percent of respondents reported they have used social media to look up consumer reviews of health treatments or physicians. This week, the White House announced its first group of Presidential Innovation Fellows. A subgroup of fellows will be working on the White House Open Data Initiatives, meant to "accelerate and expand Administration efforts to make government data more publicly accessible in 'computer-readable' form and spur the use of those data by entrepreneurs as fuel for the creation of new products, services, and jobs." Fellows will work within and across issue areas—health, education, energy, etc.—to make government data more usable by researchers, journalists, innovators, and the public at large. Video of the Fellowships ceremony below. A week's worth of data-driven innovation, decision-making, and more! Fresh Water, a Cleveland-based e-magazines that covers happenings in Northeast Ohio, highlighted a project at Case Western University's Center on Urban Poverty and Community Development called NEO CANDO. 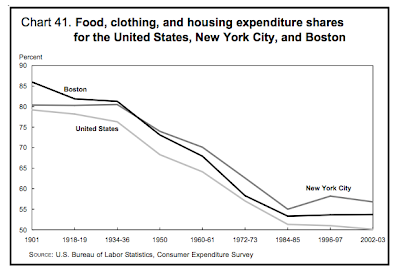 This is our story today: It is a story about how spending on food and clothing went from half the family budget in 1900 to less than a fifth in 2000. It is a story about how a nation that feels poor got so rich. 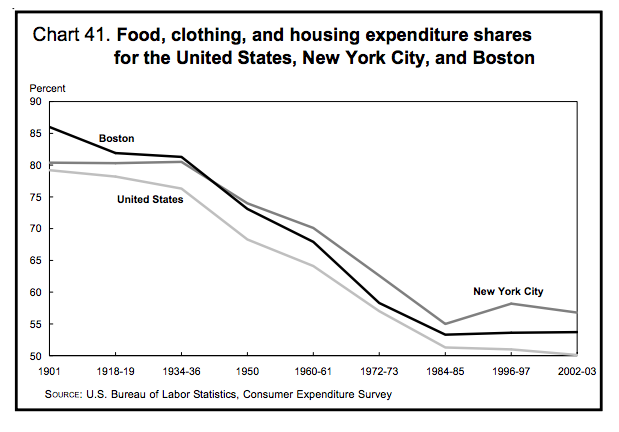 Here's the big picture in one chart showing the share of family spending per category over the 20th century. The big story is that spending on food and clothes has fallen massively while spending on housing and services has gone up. Although the report is several years old, it remains a great example of the kinds of insights about society that can be derived from government statistics. on Monday, IBM's Les Rechan argues that data-driven decision-making could alleviate if not solve many of Canada's productivity problems. He argues that "research shows analytically driven organizations outperform their competitors, delivering 49% higher revenue growth, 20 times more profit growth, and a 3% higher return on invested capital." Big data is being brought to solve the next generation of information security problems, but big data is being brought to solve the next generation of IT operations problems, things like application performance monitoring and root-cause analysis and behavioral monitoring of applications and behavioral learning. It's the same type of problem. Help me understand where anomalous behavior exists in my systems. Sometimes it's going to be security issues; sometimes it's going to be an operational issue, but the fact that it's anomalous behavior is of interest to both. ZDNet published a podcast featuring a discussion with several key stakeholders in a massive undertaking to collect and analyze ocean and climate data, Ocean Observatories Initiative and the Cyberinfrastructure Program. The project is an amazing example of how different actors and interests can pool resources around massive amounts of data to do massive good. A few bits of data-driven awesome as you head into your weekend. In the Financial Post on Monday, IBM's Les Rechan argues that data-driven decision-making could alleviate if not solve many of Canada's productivity problems. He argues that "research shows analytically driven organizations outperform their competitors, delivering 49% higher revenue growth, 20 times more profit growth, and a 3% higher return on invested capital." recently published an extensive piece on the obstacles faced by European entrepreneurs. The data is gloomy, but the authors do highlight signs of growth coming from the Internet industry. For instance, while most start-ups find it hard to attract top-tier American venture firms, the audio and sound sharing platform Soundcloud has bucked the trend, receiving funding from Twitter-backer Union Square Ventures. In 2001, a survey comparing the practices of 104 VC firms in Europe with 67 American VC firms found that the former had a smaller percentage (38 percent) of early-stage investments in their portfolios than the latter (50 percent). However, the difference was greater for older VC firms (those established prior to 1997; 31 percent for Europe vs. 48 percent for America) than it was for younger VC firms (45 percent for Europe vs. 53 percent for America). The authors go on to conjecture that this is largely due a culture of EU investors who are more averse to risk in the US investors, and as such, they are more inclined to invest in established ventures. … entrepreneurs in second or later ventures have a 4.1% higher probability of succeeding than first-time entrepreneurs. At the means of the other variables, entrepreneurs in their second or later ventures have a predicted success rate of 25.0%, while first-time entrepreneurs have a predicted success rate of 20.9%. This finding is consistent with the existence of learning-by-doing in entrepreneurship. In this view, the experience of starting a new venture—successful or not—confers on entrepreneurs some benefits (skills, contacts, ideas) that are useful in subsequent ventures. The authors note that presence of top-tier VCs matters when it comes to first time entrepreneurs and entrepreneurs whose previous venture failed. But with EU investors favoring more mature businesses over infant start-ups, perhaps a jolt of expertise to cultivate a community of successful entrepreneurs could create a positive feedback loop in which success breeds success, thus changing attitudes toward investment in early companies. Look at it this way: if Europe can create a healthy base of entrepreneurs like those that started Soundcloud, then the money will follow. Success will, too. The Economist recently published an extensive piece on the obstacles faced by European entrepreneurs. The data is gloomy, but the authors do highlight signs of growth coming from the Internet industry. For instance, while most start-ups find it hard to attract top-tier American venture firms, the audio and sound sharing platform Soundcloud has bucked the trend, receiving funding from Twitter-backer Union Square Ventures. published an infographic showing how nations compared at the Olympics applying the US Electoral College system to gold medal counts. It's unusual, but it's an interesting way of reframing "success" in sports with a political institution. We started by using the total number of Electoral College votes, 538, and assigning the 36 Olympic sports with a proper share, based on the number of athletes in each sport. Votes were then awarded to the country that won the most gold medals in that sport (in two-way ties, the votes were split). View the full interactive graphic here. The Wall Street Journal published an infographic showing how nations compared at the Olympics applying the US Electoral College system to gold medal counts. It's unusual, but it's an interesting way of reframing "success" in sports with a political institution.
. IBM's Michelle Zhou, a participant in today's colloquium, guest blogged for Huffington Post earlier this week, writing about the four "V's" of data—velocity, volume, veracity, and variety—and the value of data to the end user. Last month, Deloitte released "Data Nation 2012: Our Lives in Data," a report that "examines the UK public’s attitudes towards the collection and exploitation of their data by organisations in both the public and private sectors." They described targeting advertising as the analysis of data about a population to determine who should receive a persuasive message, how, when and for what reasons. They described tailored advertising as shaping a persuasive message for a particular individual based on conclusions the targeting process generated about that person’s interests and values. Here's a short list of happenings in the world of data. Today, IBM is hosting a research colloquium on data-driven innovation in the entertainment industry titled "Box Office to Front Office: Winning with Big Data." Watch the event's livestream here. IBM's Michelle Zhou, a participant in today's colloquium, guest blogged for Huffington Post earlier this week, writing about the four "V's" of data—velocity, volume, veracity, and variety—and the value of data to the end user. for exploring global education data. In particular, their pre-generated dynamic maps leverage Google Earth to show sub-national economic indicators. Users can also search a library of graphs and maps to use in reports and presentations. 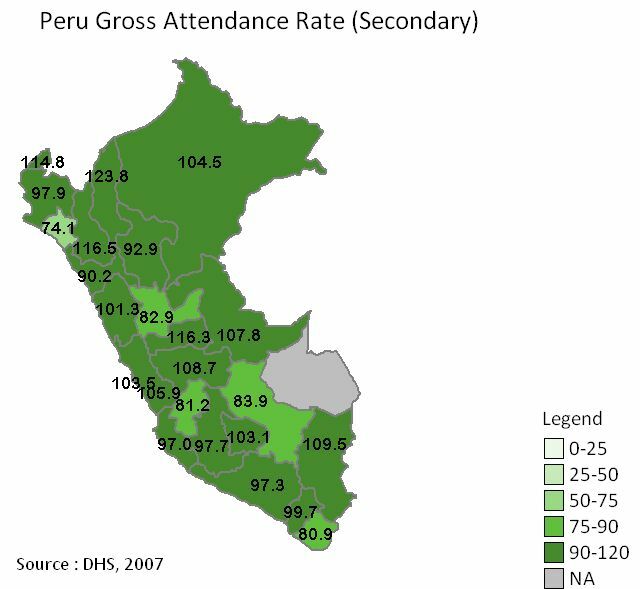 For example, the image below is a pre-generated map of the secondary gross attendance rate for Peru, 2007. The EPDC site also offers some basic tutorials on how to make simple graphs in Excel. The Education Policy and Data Center, a collaborative effort including WorldBank and UNESCO, has a robust part of their website dedicated to data visualizations and tools for exploring global education data. In particular, their pre-generated dynamic maps leverage Google Earth to show sub-national economic indicators. Users can also search a library of graphs and maps to use in reports and presentations. For example, the image below is a pre-generated map of the secondary gross attendance rate for Peru, 2007. Last week, the Federal Communications Commission (FCC) released its draft “Principles for Open Measurement,” which set a new high-water mark for rigor in public sector broadband measurement programs. This is an important commitment to rigorous, scientific research that can serve as a model for other public sector initiatives. You can view the FCC’s published principles here, here, and here. As governments have sorted out policies for collection, analysis, and dissemination of public sector information, there’s broad consensus around openness as a keystone value. Making public sector information accessible drives innovation, allowing third-parties to make the data more useful to citizens. And opening up access to public sector information drives economic growth. In one study, experts estimate that in Europe alone the benefits could amount to €140-180 billion annually. When the FCC started its broadband measurement program over 2 years ago, it baked openness into its practices by relying on Measurement Lab (M-Lab). Consumers use M-Lab to test the speed and performance of their broadband connection, and all the tools and data are made openly accessible so that they can be reviewed, improved, and validated rigorously. Over 180 million tests have been run (more than 575 terabytes of data collected), and third parties have been able to turn the data into visualizations of speed and performance that are useful to consumers. We're excited that the “Principles for Open Measurement” reflect the same principles that underlie M-Lab and the benefits the project has created for researchers, policymakers, and users alike. Meredith Whittaker is a Program Manager in Google Research. She leads initiatives related to Internet measurement, and helps coordinate Google's support for the M-Lab Collaborative. Data is the bedrock of sound public policy. But which data? How should it be collected and by whom? And how can governments make it accessible and useful to everyone? 6. Pride: Decision-Driven Data Making. Rather than running tests and using data to confirm or deny assumptions, this Deadly Sin is where you dig through data to confirm your preconceived notions. "We see this happen a lot throughout organizations, both at the executive level and within teams," Williams said. "People try to confirm what they believe; they dig through data to find it." But the best data-driven cultures have mantras like: "Data wins arguments," he said. Let the data speak the truth. If you've been waiting for the ultimate infographic that visualizes just how much data is created every minute, this infographic on Domo's blog is for you. The Information Security Forum released a report, "Data Analytics for Information Security" [report behind paywall for non-members], the potential for massive amounts of data to help us detect and reduce cybersecurity risks. As Computer Weekly reports, "...the importance of big data analytics has never been greater, with data volumes growing at around 2.5 million terabytes a day." The open data agenda has raised awareness of the value of data and other information assets in making good decisions. Maps, visualisations and other tools built using the data ‘because it is there’, have created wider awareness of new technologies that make data easier to manipulate, present, share and communicate. Interactive, web-based tools are starting to put data into the hands of ordinary managers and decision-makers. Where they once needed to wait for data from an analyst or GIS specialist managers are increasingly able to access and interrogate datasets on demand through shared online tools. Happy Friday! Here is this week's highlights of data stories on the web! worked with Special Broadcasting Service to make the 2011 Australian census more accessible to the public. They broke the data into "digestible bits," visualized the bits through crisp, clear design, and added descriptive text to help people understand what they're seeing. The result is the Census Explorer, an interactive site that lets users manipulate inputs and engage with the charts, graphs, and density maps. Sydney data visualization firm Small Multiples worked with Special Broadcasting Service to make the 2011 Australian census more accessible to the public. They broke the data into "digestible bits," visualized the bits through crisp, clear design, and added descriptive text to help people understand what they're seeing. The result is the Census Explorer, an interactive site that lets users manipulate inputs and engage with the charts, graphs, and density maps.